We are beginning to look at the temptations of Christ. What made them real temptations? What were some of the issues involved? And how can we walk in victory over like temptations or testings? Before we begin looking at the first temptation, let’s look at the context of what led to the temptations of Christ. Jesus lived about 30 years as a normal human being…so normal that when He began to speak of being the Son of God people thought He was crazy. As far as we know, after the events surrounding His birth nothing unusual happened. He grew up as a normal boy, learned Scripture and a trade as every Jewish boy did. It is likely that sometime during this period Joseph died leaving Jesus as the “head” of the family with the responsibility to provide for His mother and step brothers and sisters. At about 30 years of age, Jesus knew it was time to step into ministry…it was time to fulfill His destiny. But He was so ordinary that even John the Baptist didn’t see anything special about Him until the Spirit descended at His baptism and the Father gave His own testimony. Then John knew and launched out in faith declaring the Jesus was indeed the Messiah. What would you expect to happen after this? The Jews expected a Messiah to cast out the Roman Empire and re-establish the nation of Israel as the world power. They would have expected Jesus to declare His Messiahship and begin amassing an army. Certainly anyone who wanted to be taken seriously as a Messiah candidate would publicly announce His intentions and collect followers at once. What did happen first? Jesus was “let by the Spirit” into the wilderness. Not a likely destination for a newly announced Messiah. The wilderness was a time of testing and trial. Israel had wandered in the wilderness for forty years…usually failing the tests. It was unnecessary for them for them to take that long to cross from Egypt to Canaan. They could have reached the Promised Land in less than a month by the shortest route. Even through God chose to lead them a different way, it could have been accomplished in months, not years. It was in the wilderness that their heart was revealed as God tried to get the slavery mentality out of them - much harder than getting them out of slavery. When we look at the condition of Christianity today we may wonder why we are so long in the wilderness. Is it because God is trying to get the slavery mentality out of us? We have been so influenced by socialism and other anti-God philosophies that we are enslaved to pagan ideals. We want the government - or someone…anyone - to look after us from the cradle to the grave. Often we have a Santa Claus view of God. We want to avoid responsibility, but have all the benefits of being in charge. Many Christians even imagine Heaven as some kind of socialistic utopia. What God is after is mature men and women who can take responsibility for themselves and the world around them…and then take Godly action. Jesus went into the wilderness for 40 days - one day for each year Israel spent there. He was tried and tested by the master deceiver. The 3 temptations of Christ that we have recorded were the climax of that trial and we will look at them in more detail later. Unlike Israel, and often us, Jesus had a Biblical world-view. Because of that He was able to withstand every assault that was hurled at Him. True, Jesus was the Son of God, but if He was going to represent humanity as the “second Adam” He could not draw on that at all. He had to face life - including the temptations of Christ - as a genuine human being. The only advantage He had - which was also the advantage the first Adam had - was that He was sinless to begin with. Why did Jesus go into the wilderness right after His baptism? Why did He go from a spiritual “high” to an intense battle not only for His own life but also for the lives of the entire world [for if Jesus had given in, salvation would not have been possible]? Short answer: He was filled with the Spirit and led by the Spirit. That’s right, the Holy Spirit led Him to a place where He could be tempted by the devil and perhaps have His ministry and mission crushed before it began. Sometimes we get the false idea that if we are “led by the Spirit” everything will always go well and we will have no problems. That was certainly not the experience of Jesus. Nor has it been the experience of His followers from that time to this. We are not saved because God is primarily interested in our comfort zone! God is interested in our character, our relationship with Him, and driving the enemy from His world! That speaks of warfare not comfort. 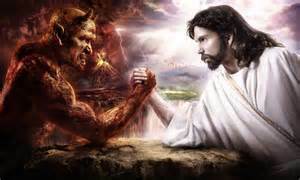 Jesus was not afraid to be led by the Spirit into a face-to-face confrontation with the devil. Another thing to note here, as mentioned above, is that Jesus went from the “high” of baptism and the testimony of the Father and John to the “low” of extreme temptation. Often we, as Christians, experience the same cycle. After a “high” experience in God we face doubt, struggle and temptation. The enemy waits until he thinks we are over-confident or relaxing our guard…and then he strikes. This is just a word of caution. When you are at a “high” point in your Christian life, do not relax your guard, do not assume you are beyond temptation and failing. Be careful [NOT fearful] and don’t be surprised if an attack comes. The wilderness experience, however unpleasant, was necessary. Over His 30 years of growing and maturing, Jesus came to realize in theory Who He was and what His mission was. At His baptism He heard a two-witness [the Father and John] confirmation that what He had learn and believed about Himself was correct. But in many ways it was still theory…still head knowledge. The only way to know that head knowledge has become heart knowledge - to know that what we say we believe has become who we are - is to test it. The temptations of Christ at the beginning of His ministry were the opportunity for Jesus to act in faith as the Son of God Whom He believed Himself to be. It was chance to prove that what He believed was True. To fail at this point would show a lack of faith in what He thought He believed. As we know Jesus passed each temptation - which we will look at in more detail in following articles. The same is true for us. It is easy to say that we believe Jesus is our Saviour. It is easy to have a head knowledge of His Lordship. We can sing that He is our Stronghold and Rock. We can convince ourselves that we really believe it…but how do we know? We know when we are led into the wilderness [we don’t led ourselves there or test ourselves!]. We know we believe Jesus is our Saviour when we hold onto Him in spite of when doubts assail us. We know He is our Lord when we obey His Word and it costs us family, friends or money. We know He is our Rock when we run to Him - not away from Him - in times of pain, fear and loneliness. The only way we can know what we truly believe - as compared to what we think we believe - is by seeing how we choose to react in times of testing…in the wilderness. Although the wilderness can seem like an eternity, it does come to an end. The test is either failed [like Israel] or passed [like Jesus]. If failed we are given the opportunity to learn its lessons again and are tested again. If passed we enter into a new confidence in God and often a new or expanded opportunity to serve Him and others. Go To Part Two: Man Shall Not Live On Bread Alone.